Traditional thermostats require you to manually adjust the temperature; otherwise, it stays steady. Adjusting your thermostat is one the easiest ways to conserve energy and save money. The US Department of Energy estimates that you can save up to 10% a year on your home heating and cooling costs simply by turning your thermostat down 7 to 10 degrees for 8 hours a day. Two forms of upgraded thermostats, described below, make temperature adjustments easy as can be. A programmable thermostat allows you to set the temperature of your home in advance to align with your schedule. For example, you can adjust the temperature several times a day based on when you are home, away, or asleep. Typically, you can vary your schedule weekday versus weekend. 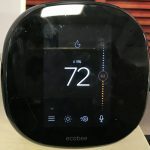 A programmable thermostat will stick to its set schedule unless you manually override the schedule for unique changes, like if you are going out of town and want to turn the heat down, or are home during the workday and need the AC running. Smart thermostats connect to wifi and automatically adjust the temperature. This makes it even easier to save money while keeping your home comfortable. Another “smart” feature is that these thermostats are able to learn your behaviors. Once the thermostat can anticipate your schedule, it will begin to automatically ramp down heating or cooling in your home as you are leaving and ramp it back up again when you are returning. Smart thermostats typically do this with an option to connect to your smartphone, so it can tell how close you (i.e. your phone) are to home. Smart thermostats also have extra features above what other thermostats can offer. For example, if you are going to be home earlier than usual, you can adjust your thermostat via your smartphone to be ready when you get back. Further, many of these thermostats provide monthly energy reports so you can track how much you spend on heating or cooling each month. This allows you to further tailor your behaviors to be as energy efficient as possible. Smart thermostats may cost anywhere from $150 to $300. While programmable and smart thermostats do cost more than a traditional type, the energy savings you realize could make the purchase worth it. Further, many utilities offer rebates to help with the cost. Check out CUB’s Saving Money page to check for rebates and discounts offered by your utility. There are a few different ways to install a new thermostat. One option is to install it yourself. Most times, it is relatively straightforward to install a thermostat on your own. Sometimes, depending on how your home is wired, you may need professional help. In that case, you could hire a contractor to install the equipment. If you are participating in a utility’s smart thermostat program, on top of providing a free or discounted thermostat, they will install one for you.